I've been looking at compasses, but more specifically the Silva 58F and the Suunto Orca. I'd like to be able to use it on both of my kayaks (sit on & sea), so that's why I've been looking at detachable ones with bungees. Are these any good? Easy to read? Etc. I got the Silva 58 with bungees and had no problems. Easy to read/see and set up, no drilling! Cheaper too. 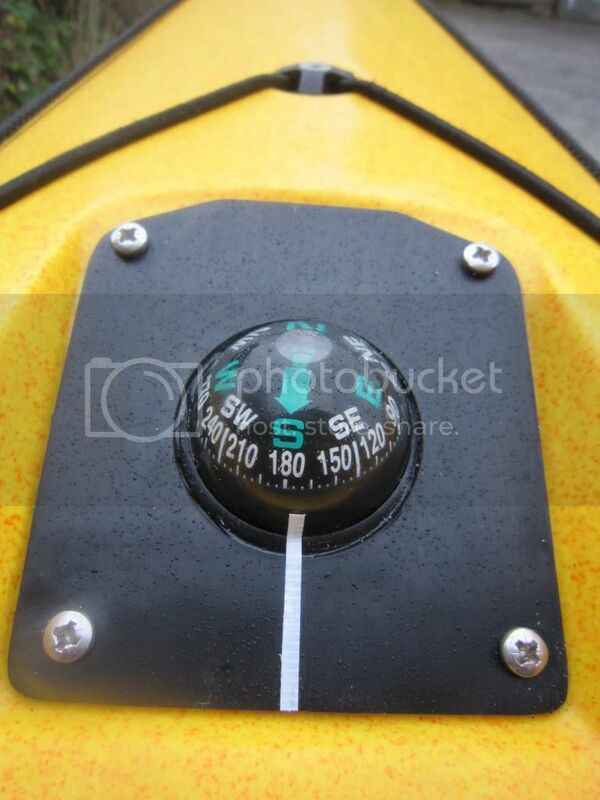 I just bought a new glass boat with a compass recess and because I'm fussy I might get a fitted one eventually. There are holes in the bottom of the bungee version also for fitting. I have used the Orca for about 3 years, but it has developed a bubble over the last few weeks, so I am not so trusting of it. Otherwise it has been great, with a 15 mile crossing being the greatest distance I've used it for. I quite like the look of the 58 as a replacement but I have an 85 that I bought years ago. But it's mahoosive. I've a feeling that it might end up on the kayak, probably bolted to the forward hatch cover. One feature of the 85 that I like is the bezzel(? ); Being able reach and use that would make complex (multiple) bearing trips easier and course adjustments en route easier too. 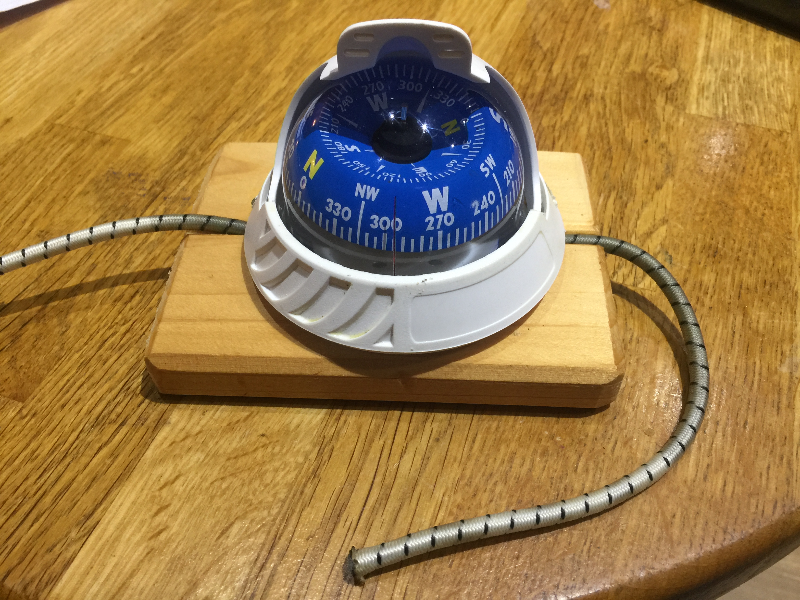 A compass too close to you can help induce sea sickness; it has happened to me once. I'm sure others will have converse opinions re; bungeed compasses but I've never had a problem. "I sink therfore I am". I have a recess for a compass on my sea boat, but at £70 a fitted one will have to wait a while. That's one of the reasons, but like I said I'd be able to use it on both kayaks. I've used the Silva 58 in the past but found it a little difficult to read at a distance. I settled for the Orca a few years back and have used it for a number of crossings. It's a bit cheap and cheerful but has done the job well. The only problem I found is the moulding at the base of lubber line actually hides the compass card a little - minor surgery with a stanley blade sorted that though. Sometimes the elastics can allow it to slip off heading a little but the Orca now comes with a bracket as well as the elastics. 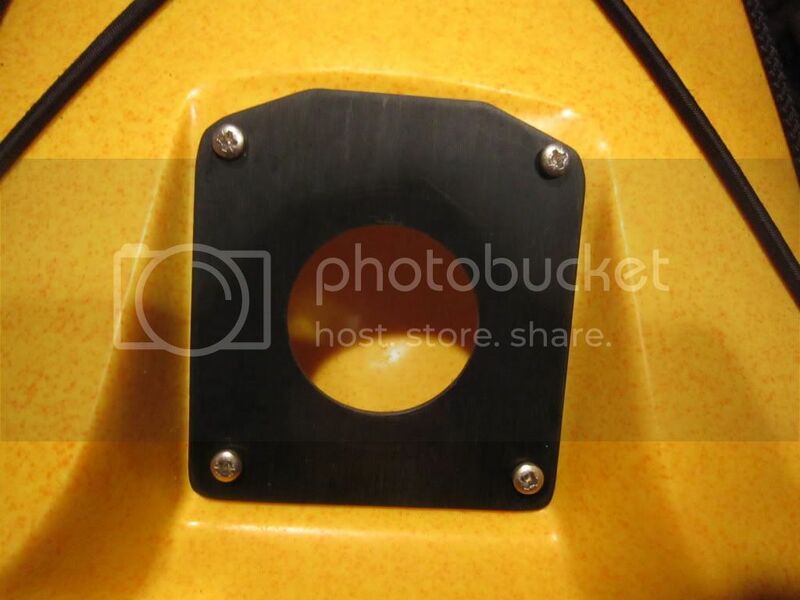 The bracket can be bolted to a hatch cover easily enough (or even the deck). I also have a Silva 70P fixed to my old Quest but over the years it has taken a bit of a hammering and has suffered with scratches (like the Quest). I prefer the Orca now as it allows me to remove it when it's not in use and I can also choose where to I want to situate it. I use a silva 85, once upon a time it was mounted on my front hatch cover but that perished. Now, three kayaks later, I have it fitted to a square of plastic cut from a chopping board and bungeed to my deck when I need it. I like the big numbers, my eye sight's getting crap. I think it was very expensive way back then, dread to think what they are now. Owen wrote: I use a silva 85, once upon a time it was mounted on my front hatch cover but that perished. Now, three kayaks later, I have it fitted to a square of plastic cut from a chopping board and bungeed to my deck when I need it. I like the big numbers, my eye sight's getting crap. I think it was very expensive way back then, dread to think what they are now. Likewise with eyesight and, believe it or not, I have a spare chopping board! Worth looking at the Silva 70 UNE as well which has built in red LED backlighting. 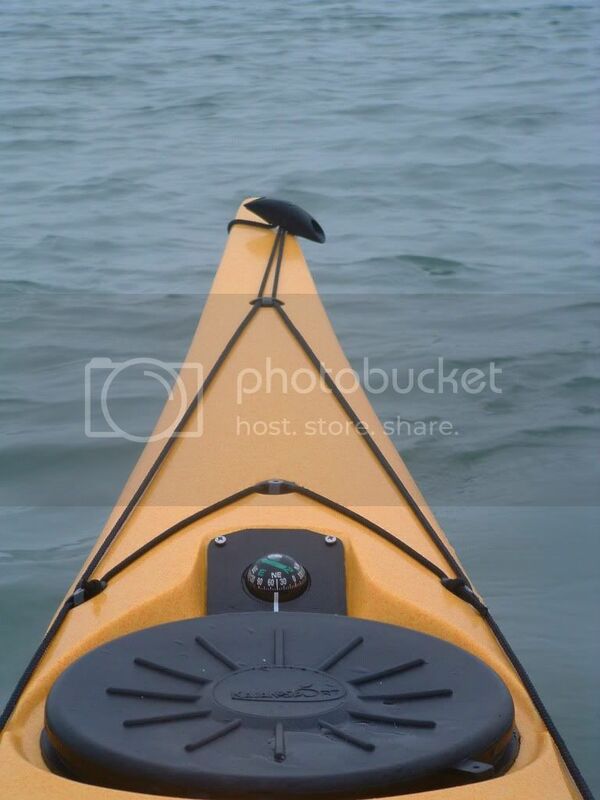 Not cheap ($180 AUD) but if you paddle at night, worth looking at. I use a Silva 70UN which I just slide out of the bracket and store safely when I don't need it. Have to admit I am wondering whether to just buy a spare bracket for my second boat, or whether to buy a UNE for the backlighting. I rarely paddle in the dark, but it is most likely to happen in error and that's one time you can't decide to go out and buy one now in preparation because it's already happened! The bodies and brackets are identical. Silva 70 UNE (one with the light). One mount Bolted onto a hatch cover for the Rockpool (which has no compass recess) and another onto the ubiquitous white nylon chopping board with bungees for using on other boats. 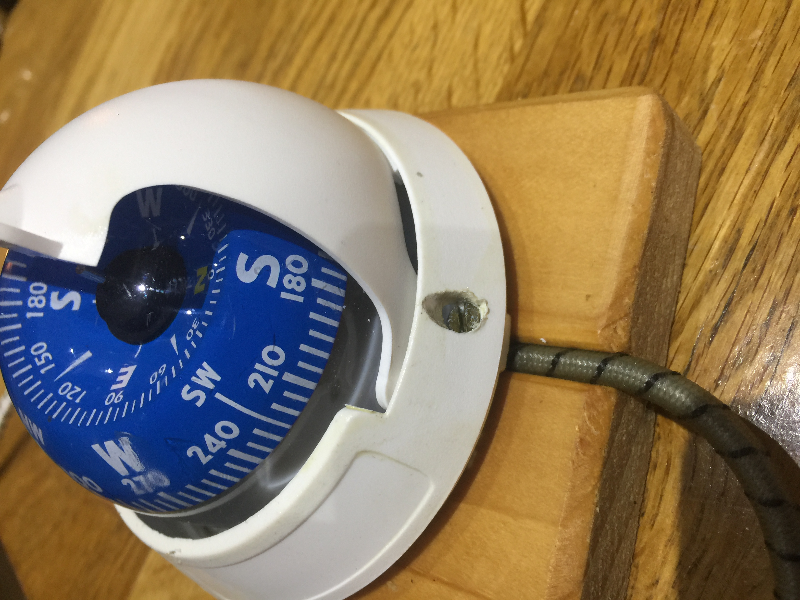 I only take it when I think it's needed and carry a Silva walking/orienteering compass in my BA pocket at all times which I would use to get me out of trouble if required. Cheers guys, I think I'll give the Orca a go. I've been using it for a year now. Although I've never had to use it in anger as an emergency navigation aid, I regularly check it, and I've found it's always pointing the right way, regardless of sea-state, and is remarkably easy to read. It also seems extremely rugged from the accidental abuse I've thrown at it. I've made my own mounting system - it's fixed to the deck with velcro, and this is backed-up with a lanyard. Question: what is wrong with it? I appreciate that it's not as big and lacks the clear colouring and fine-detail of a 'proper' compass. However, I find it easily readable and my experience of navigation whilst kayaking and scuba diving is that you never really use any finer detail than 'North East' etc. I don't personally know any 'proper' sea kayakers, so I'm curious as to what you'd think of this set-up. Well, without physically seeing one, it's hard to comment I guess but looking at the spec it seems decent enough, as is the price! Looking at the spec, it's liquid filled so I assume the movement to be damped enough to be usable at sea - its got bearings for the needle so it would seem reliable, and the degredations (5 degrees) are the same as a vastly more expensive Silva, so that all looks good. Size wise it looks comparable with many of the strap-on type instruments, again much more expensive, and if you can see it and it works, then it's all good. If it comes in at £5 inc postage, then it's got to be worth a punt. Mike. Thanks for the reply Mike. Yep, the movement seems to work extremely well. I go out in some nasty conditions, and as I'm in a short creek-boat, I'm being thrown all over the place, yet it seems to hang in there pointing the way regardless. It actually comes in at £1.62 including postage(!) so that's what prompted me to post on this thread. Perhaps the OP might want to give it a punt? I'm happy to post up photos of my Heath-Robinson mounting system if anyone needs it. PlymouthDamo wrote: I'm happy to post up photos of my Heath-Robinson mounting system if anyone needs it. Attempted to post the photos I've stored on my Flickr account. Kept getting an error message saying this site couldn't read the dimensions of my photos. Life's too short - so you'll just have to imagine a compass held on with velcro and a bit of thread. (There were two images - but the second one is showing as "currently unavailable". One thing I see is that the screws are rusting - replacing them with solid brass ones would solve that problem. Cool - thanks Mike, that's the important pic. I'm not going to bother sorting out those rusty screws as they only hold the plastic 'box' together, which is a tight press-fit anyway. (At my local chandlery, I expect 4 brass screws would cost more than I paid for the whole compass! Edit: Finally done it. There she is in all her glory. As you can see, the compass is on the wrong side of the nav light, obscuring the light to anyone directly in front. I originally did that to keep it out of the way of my paddle, but I now know that it would still be out of harms way on this side of the nav light, so I'll move it this side. One thing I do note is that there's no lubber-line - or indication on the body / globe to reference bearings against. That said, adding some form of marker to the body would be easy enough. As you say though, as a general heading compass it'll be fine. The Shiner wrote: Cheers guys, I think I'll give the Orca a go. Edit: Saw an Orca today, really tiny! Think maybe I'll wait and get one to fit the recess, and like Sprucey said just keep a small one in my pfd for when I'm fishing on the sot. Personal choice of course but I've given up on fitted silva compass as I can nolonger see the numbers from the cockpit esp not at night. I have the orca which travels from boat to boat easily when needed. I love the glass bottom which means you can put a light stick under the dial so it can be read in the dark (the small fisherman float lights work well if doubled up). Thanks to PlymouthDamo I've now got a usable compass in my Scorpio LV for next to nothing. Did the ebay thing and got it in autumn, but only got around to fitting it a couple of weeks ago. Discovered that half a plastic drain pipe on a baking sheet in the top oven of the Aga converts itself into a usefully flat sheet of plastic quite quickly. Used wet and dry paper to matt the surface (the oven treatment doesn't do wonders for the shiny surface) and a hole cutter. Took a deep breath and drilled the holes to fix the mounting plate to the hull with s/s bolts (which cost more than the compass) and some Sikaflex. The lubber line is a strip of waterproof tape. 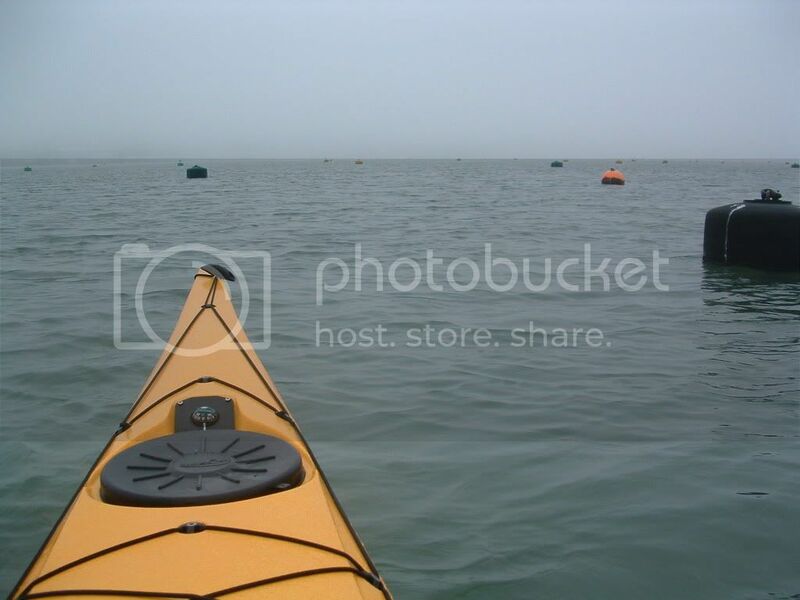 The weather obliged with thick fog in the Camel estuary ... it worked a treat. Thank you for such good info on your budget compass. Here's my take on it, the bungees go to the outer safety lines and the compass rests on the front hatch. The mounting is the first prototype and made in half a hour before I go on a trip tomorrow and test it. The bungees may also provide some second extra security for the rubber hatch on my Stratos.